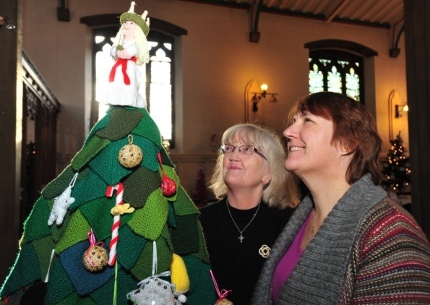 A group of knitters in Peterborough, England, have spent the past 11 months knitting patches and decorations for a wooly Christmas tree that was unveiled last weekend at All Saints Church. The tree is made up of 5 by 5 inch squares and measures five feet, six inches. The five crafters who produced the tree — members of the Crafty Crafters club — said no one counted how many green squares make up the tree but there must be more than 300. They also knit ornaments to hang from the tree and a knit angel to grace the top. The tree will be on display in the church until January. What an amazing feat of knitting! So pretty and whimsical and sweet!